One full size and one smaller sheet of waterslide decals; colour instructions. Offers 12 sets of markings for different Claude variants; terrific variety of colourful markings; detailed reference information included; stencil data supplied; decals clearly printed and in register; high quality presentation. A great range of markings presented to a very high standard for worthy models from Fine Molds and Wingsy. Any new release from LifeLike decals is something to look forward to. They research their decals thoroughly, have a happy knack of choosing interesting and colourful subjects, and they always offer comprehensive additional information. 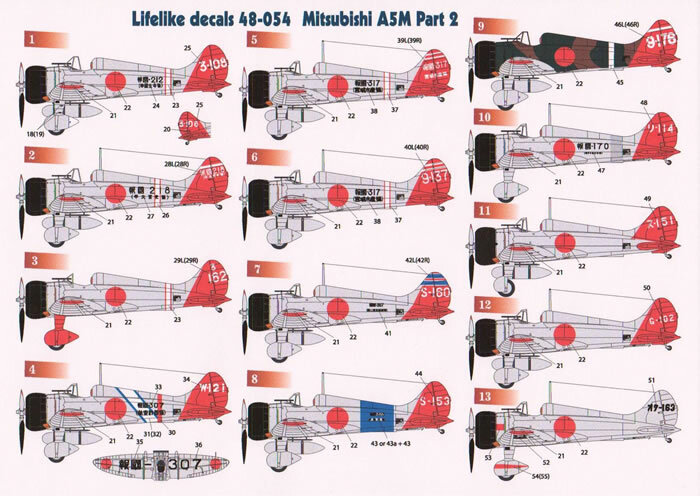 This time around, LifeLike has three brand new sets of 1/48 scale decals covering the Mitsubishi A5M Claude family. Both Fine Molds and Wingsy offer excellent kits of a variety of Claude variants. 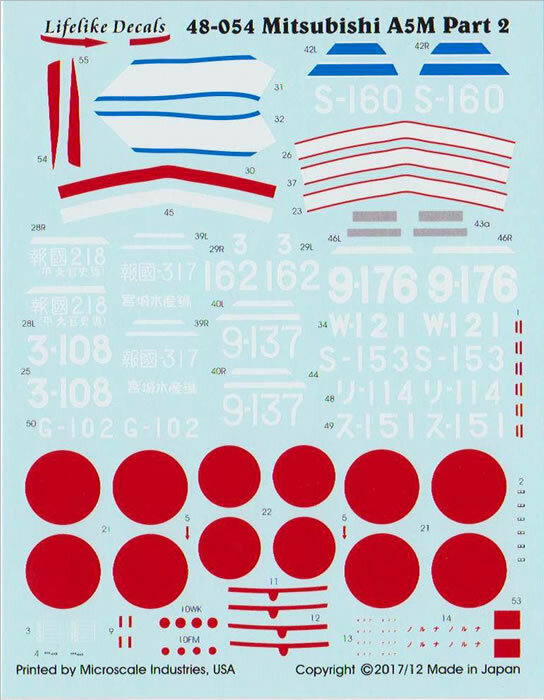 These decals should suit A5M Claude kits from either brand. Another 12 subjects are included on Part Two. 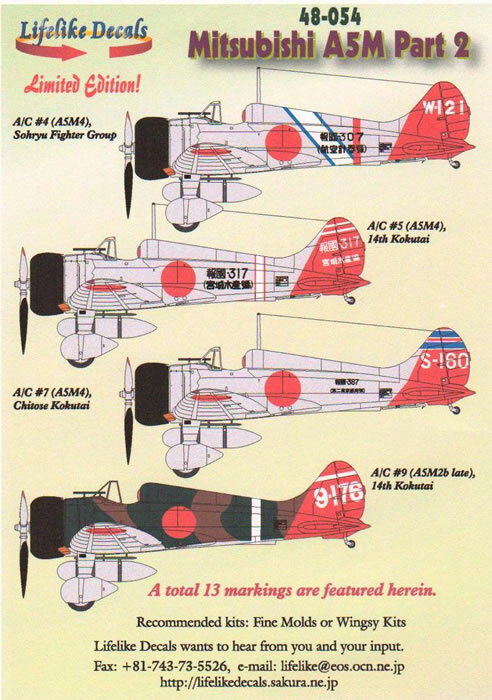 Variants covered are the A5M2b Late (four aircraft) and eight A5M4s. Eleven of the aircraft are finished in natural metal with a range of red, white and blue fuselage, wing and tail markings. One of the A5M4s is in green and brown camouflaged upper surfaces. Three folded A4 pages are included in the resealable plastic bag. The first doubles as the cover page and a stencil placement guide. The second sheet has side profiles and selected upper scrap views of the twelve subjects. Last up is one double-sided sheet of detailed information on each specific aircraft. Data on colours, markings, and operations are included. The decals are printed by Microscale and appear to be in perfect register. There is a full-sized sheet for the unique markings, with a smaller sheet of black markings. 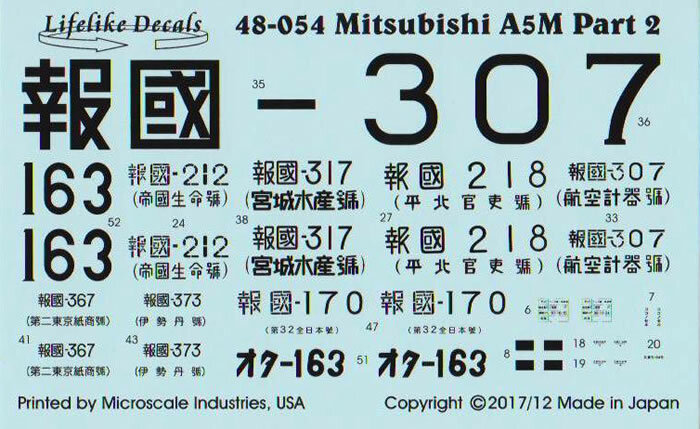 LifeLike Decals' 1:48 scale Mitsubishi A5M Part 2 offers a great range of markings presented to a very high standard for worthy models from Fine Molds and Wingsy.